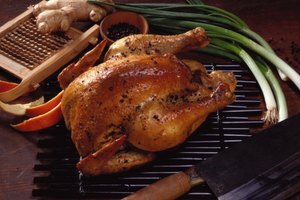 With the right garnish and presentation, roasted chicken can look like an elegant delicacy when it hits the dinner table; but in terms of prep-work and cooking it's a pretty basic go-to meal. When cooking for a large group, a 9 lb. chicken is ideal and will make between 10-12 servings. The main goal when roasting is to create a moist, tender interior with a crispy, browned exterior. To accomplish this and enhance flavor, the chicken should be brined ahead of time and basted frequently throughout the cooking process. *If you purchased a Kosher chicken you will not need to brine as Kosher chicken is brined during production. Empty the salty mixture from the container. Rinse your chicken off under a steady stream of cold water. Pat the chicken dry with a paper towel. Preheat your oven to 350 F. While the oven's heating season your chicken with herbs and spices of your choosing. To season the chicken, simply rub the seasonings on the chicken, or stuff them in the cavity and beneath the skin. Place the chicken in a roasting pan on a roasting rack in the oven. Roast the chicken in the oven uncovered for three hours, or 20 minutes per pound. Every 20 minutes remove the chicken from the oven and close the oven door to maintain temperature. Baste the chicken with the drippings from the bottom of the pan. Keep an eye on the skin. If it starts to look too brown or dry, cover it loosely with aluminum foil. Check the temperature of your chicken by inserting a meat thermometer in the thickest part of the thigh. The temperature should be a minimum of 165 F in order to be safe for consumption. Other signs of doneness include juices running clear when a skewer is inserted in the thigh and the drumstick moving freely when you wiggle it. Common chicken seasonings can include salt, pepper, butter, olive oil, rosemary, thyme, sage and garlic. Pieces of onion or garlic clove and/or wedges of orange or lemon can be placed inside the cavity of the chicken to enhance its flavor. Wash you hands with hot water and soap before and after handling raw meat. Always use pot holders when taking items in and out of the oven.